President Donald Trump is expected in Palm Beach this weekend. The Federal Aviation Administration issued an alert to General Aviation pilots warning of VIP movement on Friday, March 2 through Saturday March 3.. The President’s 2020 campaign is hosting a fundraiser at Mar-a-Lago on Saturday night. Expect the usual road blocks and checkpoints around Mar-a-Lago and Southern Blvd. bridge. 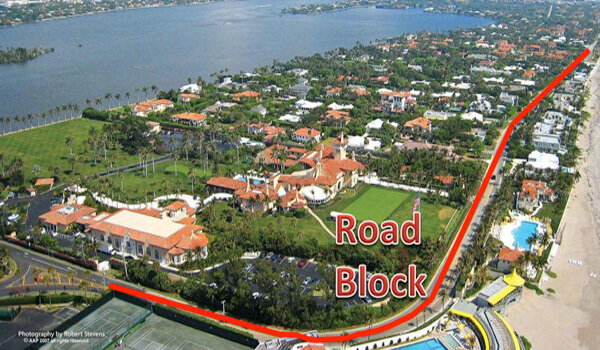 The process of establishing checkpoints and road closures in and around Mar-A-Lago will begin Friday, March 2, 2018, no later than 6AM. Expect traffic delays and road closures in this area thru Saturday, March 3, 2018. Motorists are encouraged to seek alternate routes. It is recommended that all household staff, landscaper maintenance companies, pool companies, etc. adjust their schedules accordingly so as not to spend an unnecessary amount of time in traffic due to the closure. As always, motorists are strongly encouraged to refrain from cellular phone use or any other distractions while driving to assist in the movement of traffic. During the closure period, all forms of travel, including pedestrian travel, are prohibited on S. Ocean Blvd from the intersection of S. County Road to Southern Boulevard. The travel restrictions will also extend eastward to the ocean. If you are a resident living south of the South Ocean Blvd. and South County intersection you will be granted access with proper credentials. As a reminder, commercial vehicles (including landscaping trucks) are prohibited from traveling east on Southern Blvd and North of the 1200 block of S. Ocean. Marine security zones will be in effect during this period.